“Taking inspiration from the trippy world of Alice in Wonderland and his strong house and techno roots, Butch announces a four date residency at Berlin institution Watergate. Continuing to blur the boundaries between music and art Butch announces a high concept four date residency at world class underground music venue, Watergate. 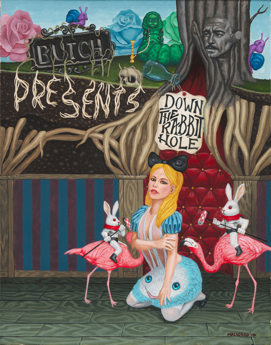 Pulling together some of the underground’s hottest artists, Down The Rabbit Hole is fast becoming Berlin’s most eagerly anticipated party of summer 2016. Breaking ground on Tuesday 19th July, Butch invites electrifying techno act San Proper to join him in the legendary Watergate booth for a night of big beats and bigger vibes. The Dutch powerhouse is no stranger to the Berlin club scene having cut his teeth on the international rave circuit over the past fifteen years. Making him a very welcome addition to the Down The Rabbit Hole opening party. London based house and techno don Skream joins Butch on Tuesday 2nd August, marking his return to the German capital after a two-year hiatus. Having made a name for himself as an artist capable of blending a plethora of sonic genres into his high energy sets, Skream’s appearance at Down The Rabbit Hole is a must attend for any dedicated raver.